Our High 5 Chocolate is a great combination of Art and Science as it represents the true art of chocolate making in its taste and richness. This High 5 Chocolate is made out of best quality ingredients and has great health benefits. 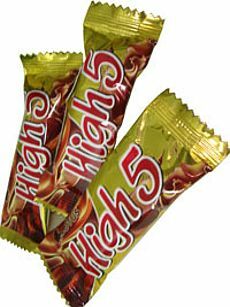 With rich creamy and soft caramel nougat covered by yummy encompassing chocolate, High 5 gives a sensation and taste found nowhere else. Our High 5 Chocolate is hygienically packed to prevent contamination.